International Women’s Day (IWD) was observed for a whole week as ‘International Women’s Week’ in Delhi. A state level rally was organised jointly with 31 organisations on March 8 but AIDWA also held its own programmes in the units/districts. International Women’s Day (IWD) was observed for a whole week as ‘International Women’s Week’ in Delhi. A state level rally was organised jointly with 31 organisations on March 8 but AIDWA also held its own programmes in the units/districts. Distribution of leaflets and fund collection was organised in all districts. Then in each of the districts public programmes were conducted to mark the week; in some districts apart from district level meetings, some units also observed IWD. About 15 meetings were held in Delhi, Ghaziabad and Noida. Women assembled near Mandi House and marched to Parliament Street where a public meeting was held. Most of the 31 organisers participated in the programme with speeches, songs, a dance performance and a street play. Mariam Dhawale spoke on behalf of AIDWA. From our organisation in Delhi around 350 women took part in the march and the public meeting. Punyavati, Asha Sharma and Maimoona Mollah were also present in the rally. Kerala: Lively programmes attended by thousands of women were held in all the 14 districts in Kerala. These programmes were held jointly along with DYFI, AIWWCC and others. Rallies, public meetings, cultural programmes and poster exhibitions were held in the districts. Cultural competitions for women were also organised. The AIDWA state committee sent a script for a play against communalism to all the district committees. Dramas were staged in five districts by all women actors. P K Sreemathi, Sathi Devi, Susan Kodi and other leaders participated in these programmes. West Bengal: Open meetings could not be organised because use of microphone was not allowed due to school board examinations. All the districts hoisted AIDWA flags in the morning and arranged rallies, hall meetings, blood donation camps and cultural programmes. Hall meetings were organised in Burdwan, Asansol and Birbhum. Kolkata district arranged street-corner meetings in several places. Badges with our central and local demands were distributed in these meetings. It is a good feature that people gladly put on the badges and expressed solidarity with AIDWA activists. Malini Bhattacharya, Anju Kar, Kananika Bose Ghosh and other leaders addressed these meetings. Tamil Nadu: Programmes were planned to celebrate IWD during the entire month of March; not restricting them to only March 8. They took place in 43 centres in 17 districts. Of these 14 were jointly conducted with other organisations and others were solely conducted by AIDWA. A total of 7,612 women participated. 12 districts and 16 centres conducted women's day events from March 15-31. Efforts were made to jointly conduct events with other Left women's organisations and NGOs. Organisations such as Working Women's organisation, NFIW, SUCI, YWCA, MCCSS, Manidhi, Self Help Groups, TNSF, SFI, DYFI participated in joint events. Middle class organisations like LIC, BSNL, BEFI, TNGEA women sub-committees participated. Seminars, public meetings, book reading sessions (amongst young women), demand based demonstrations, general body meetings and street corner meetings were conducted. These programmes were addressed by U Vasuki, P Suganthi, S Valentina and many others. 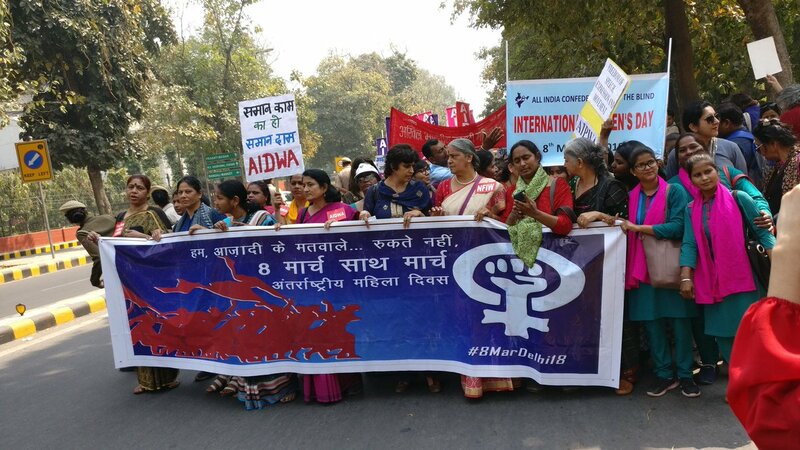 Maharashtra: IWD was observed with great fervour by the AIDWA in 11 districts. AIDWA, CCWW (CITU) and 11 other women’s organisations took out a spirited march through the crowded streets of Mumbai raising slogans of women’s unity, defence of the constitution, opposing communal and caste violence, opposing regressive and patriarchal values and asserting their right to make independent choices and decisions and demanding right to employment, minimum and equal wages, social security, free health services, education and 33 per cent reservation. The march of 350 women ended in a public meeting which was addressed by Sonya Gill and others. A play questioning regressive rituals and values was also staged. Over 1500 adivasi women marched on the Western Express Highway at Talasari in Palghar-Thane district which culminated in a public meeting. At the main junction of Talasari, a demonstration was held to condemn the BJP-instigated violence against Left activists and AIDWA leaders in Tripura. Lahani Dauda and other state leaders addressed the meeting. 27 women’s groups jointly marched in Pune from the Railway station to the Collector’s Office and held a dharna which was addressed by district and state leaders. A delegation gave a memorandum of demands to the collector on policy issues as well as district issues faced by women. The AIDWA in Solapur held a large women’s meeting in the Beedi workers’ Colony (Godutal Gharkul) which was addressed by Naseema Shaikh and other state leaders. AIDWA along with CITU – Asha workers, Mid-day meal workers, powerloom and domestic workers – held a meeting at Ichalkaranji in Kolhapur district. A meeting with Muslim women was held in Sangli. A delegation met the collector to demand arrest and strict action in the spy camera incident discovered in the women’s changing room of a private city hospital. Women’s meetings were also held in Amravati, Wardha, Nasik city, Satara and Raigad. Rajasthan: Sports competitions were organised in Jaipur. A dharna for closure of illegal liquor dens is going on in one area and March 8 was organised in a big way here. A signature campaign and poster exhibition on violence against women was organised in many places from March 4-8 in Alwar. Some prominent activists of the women’s movement were felicitated. An enthusiastic rally was organised in Bikaner accompanied by dhol and nagaras. A sports competition was organised in Hanumangarh. Women sang songs for equality and emancipation. A seminar was held in Sikar on March 6. Women held a militant march, breaking the ban orders imposed by the police. They stormed the collectorate and submitted a memorandum to the SDM. In Sriganganagar, a get-together was organised on Holi on March 3. Many women’s organisations participated in this programme. A talk show titled ‘My choice, my security, my right’ was organised in a college among girl students and women professors on March 4. On March 5-6, a folk song and dance competition was held in the rural areas where most of the participants were MNREGA workers. A human chain for secularism was formed in the market place on March 7. A discussion on the burning issues confronting women was held and a memorandum was submitted to the chief minister on March 8. A demonstration was held in Jodhpur. Programmes were also held in Udaipur, Dungarpur, Boondi and Kota. These programmes were addressed by Sumitra Chopra, Durga Swami, Chandrakala Varma, Kusum Saiwal and others. Madhya Pradesh: AIDWA organised joint programmes with Anganwadi, Asha and Usha unions in the state. A week-long programme was organised in Bhopal. Various competitions were held for women, young girls and children. Revolutionary songs were sung by women. The public meeting was addressed by Sandhya Shaily, Neena Sharma and leaders of the various unions. A public meeting was held in Gwalior at the samadhi of Rani Laxmibai. Various competitions were held in Sihore too. The public meeting in Jabalpur was addressed by Shaila Shukla. A women’s parliament was organised in Chhindwada jointly by AIDWA and other organisations. Jharkhand: Rallies were organised in Dhanbad, Bokaro, East Singhbhum, Pakud, Ranchi, Namkumb, Godda, Sahebganj, Jamtada, Saraikela and Koderma. Memoranda were submitted to the district collectors on a 13 point charter of demands. Maya Layak, Geeta Jha and Beena Linda addressed these meetings, which were attended in all by 3,650 women. Orissa: Programmes were organised in Bhubaneshwar, Bhadrak, Balasore, Cuttack, Gunjam, Jagatsinghpur, Puri and Sundargarh. Hall meetings addressed by renowned personalities, joint programmes with working women and protest demonstrations were organised in these districts. More than 1,550 women attended these programmes which were addressed by Tapasi Praharaj, Pushpa Das, Sandhya Das Majumdar and others. Andhra Pradesh: Cultural programmes were held in Vishakhapatnam. Protests were organised at the Vizag airport demanding formation of a media monitoring committee and action against film director Ram Gopal Verma. Programmes were also held in the various districts in Andhra Pradesh. Bihar: Rallies were organised in Patna, Samastipur and Chhapra and they were attended by over 625 women. Among those who addressed were Rampari, Neelam, Geeta Sagar and others. Punjab: Public meetings were held in nine districts and these were attended by around 1,350 women. They were addressed by Subhash Mattoo, Krishna Kumari and others. International Women’s Day programmes were also held in various districts in Assam, Chhattisgarh, Gujarat, Himachal Pradesh, Karnataka, Tripura, Telangana, Uttarakhand, Uttar Pradesh and Haryana.